The Night Circus seems to be one of those novels that slipped under some radars but thankfully not everyone’s. I finally gave into friends and reliable reviews lauding this book and kicked myself for not having read it the week it came out. Morgenstern’s first novel is astounding. She has achieved out the gate what others strive at for decades. Light delicate sentences that almost seem to give too little, give just the right amount of description for your imagination to fill in the gaps. Word choices and images of spaces stay with you long after the book is closed for the night. 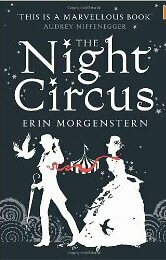 At first glance, ‘the Night Circus’ appears to be a classic fantasy novel with magic and illusionists, intrigue and star-crossed lovers but Morgenstern has given us a truly new fairy tale, where the victims become the heroines with the lesson being some times you have to build a maze to find the center. Without giving too much away, the story centers around the events of two illusionists, of different methods, setting out to prove which of them is better. A classic tale to be sure but the results of their weapons of choice set the whole thing apart. Two children who grow up in an insular and singular world of misinformation, lies, and sometimes cruelty, to become the weapons in the illusionists battle of wits. The result of this battle is astounding and further reaching then any of the party could have known. What kept me up much too late were the elements of love, betrayal, loyalty, and family that were outcomes and causalities of the battle. The book itself is designed to enhance the story with the cover art intricately simple and a color scheme that takes on new meaning as the story progresses. With in the pages, the story flows between countries, time, and a set of characters that are as flushed out as the leads, making an enticing ensemble to pick and cheer for your favourite. A tip though is to keep an eye on the dates at the beginning of each chapter; things will make much more senses later as a result! I was unable to put this book down for a variety of reasons. The language Morgenstern used to descript an illusion, a room, a rainy night, first meeting are pitch perfect. I was able to see the ribbons fluttering on the illusions dress, see the party raging in the dreary rainy night with in a handful of crisp sentences. Her characters I would recognize should they pass me on the street, her female leads as flawed as her males who struggle with doubts and obligations. Over all, ‘The Night Circus´ is one of the best books I’ve read this year. It is more then just an incredibly well written novel of old men’s waning pride, young love, first true love, and what is means to find a destiny away from the one you thought. It re-sparks the imagination, makes you rethink the coming night, and remember that love and family can come from the most unlikely places.